Mega Sale! Save 29% on the Hyster 186304 2 Piece Hyster Forklift Key Set by HYSTER at In The National Interest. MPN: 186304. Hurry! Limited time offer. Offer valid only while supplies last. This Hyster 186304 key set is a set of two identical replacement ignition keys for the Hyster S30XL forklift (for serial numbers B010B03066 and up). 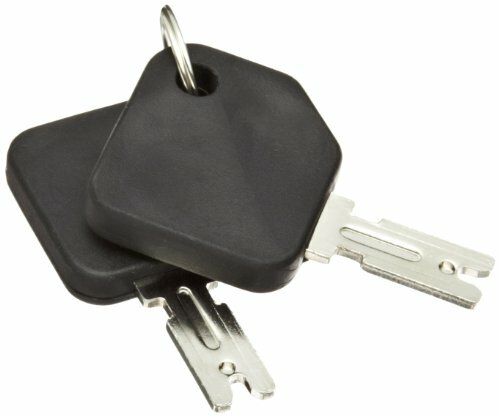 This Hyster 186304 key set is a set of two identical replacement ignition keys for the Hyster S30XL forklift (for serial numbers B010B03066 and up). The key has a rubber coated grip for comfort and is pre-cut. Hyster manufactures forklifts, forklift truck components, and other material handling equipment. The company, founded in 1929 and headquartered in Greenville, NC, meets International Organization for Standardization (ISO) standards 9001:2008 and 14001:2001/2004.